Cessna and Avic are celebrating the recent delivery of the first China-built example of the Citation XLS+. Cessna Aircraft comes to ABACE 2015 on the heels of a milestone year in China, with highlights including the delivery of the first Citation XLS+ produced by its partnership with Avic, and the impending certification here of the Citation X+ and Citation Sovereign+. The company puts China first among export development markets, and this is evident in its having U.S. English and Chinese versions of its website. The Cessna-Avic Aircraft (Zhuhai) Co. joint venture assembles the XLS+ for sale in China using parts, components and sub-assemblies provided by Cessna. 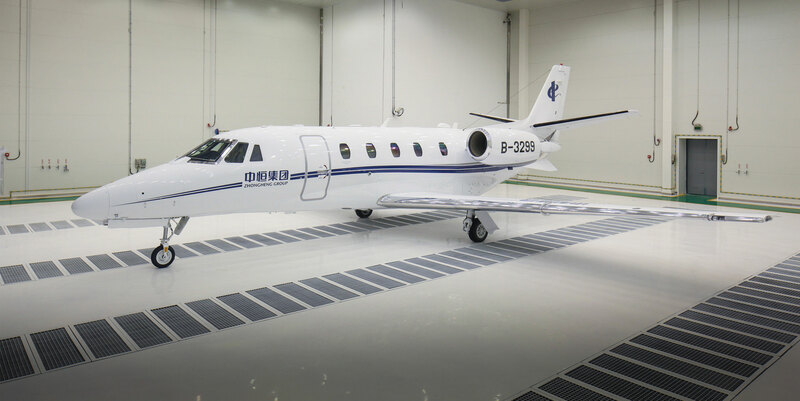 Formed with China Aviation Industry General Aircraft Company Ltd. (CAIGA), the company received its business license last July, and delivered the first two XLS+ midsize business jets to Guangzhou Zhongheng Group, Ltd. at Airshow China in Zhuhai last November. The light-midsize XLS+ carries up to 12 passengers, and with a range of 2,111 nm, it can fly nonstop between Beijing and Hong Kong, or Shanghai and Hong Kong. Meanwhile, Wichita-based Cessna’s Citation X+, the world’s fastest business jet, and the newly introduced Citation Sovereign+ are on track to gain certification from the Civil Aviation Administration of China (CAAC) this year. The Citation X+ made its first appearance in China at the Zhuhai show last November. The midsize-cabin Citation X+ seats up to 12 passengers, has a maximum operating altitude of 51,000 feet (15,545 meters), and a maximum speed of Mach 0.935. Its 3,408-nautical-mile range gives operators the ability to fly non-stop between Beijing and New Delhi, Singapore and Tokyo, Shanghai and Darwin, or Hong Kong and Dubai. “The whole of Asia is one flight away,” said Ernest. Both cabins feature Cessna’s Clairity cabin management system that offers passengers smartphone or tablet control of cabin lighting, window shades, temperature, and audio and video entertainment (digital media, MP3/iPhone, Blu-Ray). The interior of all three models can be configured in a wide array of seating layouts, color choices and entertainment options, and can be outfitted for international Wi-Fi connectivity, ensuring time onboard can be spent productively–even as they optimize productivity on the ground. “Having the ability to quickly meet face-to-face with business partners and customers is key to our continued success and business growth,” said Madam Xu Shuqing, chairman and president, Guangzhou Zhongheng Group, launch customer for the China-built XLS+. The most distinctive outward difference of both the Citation X+ and Sovereign+ over past Citation models is the addition of winglets, allowing the aircraft to cruise efficiently at higher altitudes and consume less fuel, as well as improving takeoff and landing performance at higher elevations or on hot days. Cessna’s C-208 production partnership in China has also had a successful year. Cessna-AVIC Aircraft (Shijiazhuang) Co., another joint venture with CAIGA, has been delivering the single-engine turboprop aircraft for sale in China since December 2013. In March 2014, CAAC granted approval for the Cessna Grand Caravan EX to operate on floats in China, resulting in an increase in orders for amphibious models, capable of operating from land or water. The joint venture operations in Shijiazhuang include final assembly, paint, testing, interior installation, customization, flight-testing and delivery.